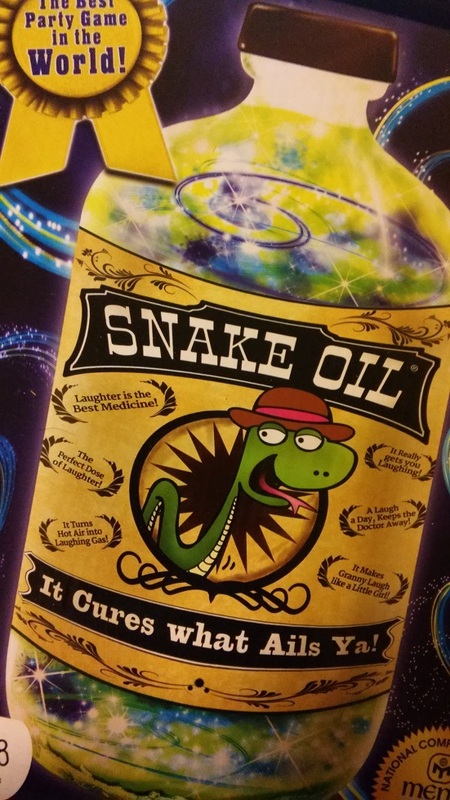 Snake Oil is a party game by Out Of The Box Games. In this game, each player takes a turn being a "customer"--the customer is some sort of profession ("Teacher"), character ("Santa") or other demographic ("Dumpster Diver"). Every other player serves as a pitchman. Each pitchman has a hand of cards with various words on them, mostly nouns (things like "Toy," "Armor,""Space," and "Cheese") and each player combined two of these cards to make an item to sell. For example, a player may attempt to sell Cheese Armor (combining two of the words above) or perhaps a Diamond Whistle or a Rainbow Garden, all keeping in mind the target. A Diamond Whistle might be an easy sell to a Diva, but not so much a Priest. The Customer then selects the player who made the best pitch, and they score a point. The player with the most points after a set number of rounds wins! It's easy to learn and set up. You could cut my description above in half and still be able to adequately explain the rules. The word combinations are pretty solid. Unlike some other party games, where you may have a hand of cards and you just can't do much with any of them, you can almost always find some sort of combination that fits. Of course, coming up wtha n absurd rationalization as to why a caveman wants a space vacuum cleaner is half the fun. It's quick--but also customizable. The rules say each player gets one crack at being a customer, but that's far too few. A few rounds, or at least playing to a specific set of points, is a better way to go. but you can play however you wish. Just like any "judge" game, like Cards Against Humanity or Apples to Apples where one person picks who gets the point, they can "game" the system. If they really want a specific person to win, they can simply award them the point regardless of the pitch. If you're playing with people who just want to win, this game isn't for that player. If you play with non-jerks, though, this isn't a problem. The customer card deck seems a little low. There's only about 26 cards, although they are double-sided. so there's about 50 unique customers. Given that there are something like 600 word cards it seems like they could have added more. A minor issue, since the customers are varied and interesting. I rate this a good A-. My fear is that it can easily be replaced with a lot of similar games, and if you don't have players who enjoy this sort of thing it can fall flat. This is more the fault of the group and not the game, though.